Okay, not the most stable US share to kick us off, but for the longer term, this may be a place to start. 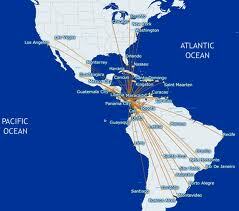 Copa Holdings is a passenger and cargo airline service headquartered in Panama City. They have 66 destinations in 29 countries in North, Central and South America and the Caribbean with one of the youngest and most modern fleets in the industry, comprising 90 aircraft: 64 Boeing 737NG and 26 EMBRAER-190s. Copa also provide services within Colombia, and international flights from various cities in Colombia to Panama, Venezuela, Ecuador, México, Cuba, Guatemala, and Costa Rica. Panama’s currency pegged at par with the US dollar, not likely to be affected by currency fluctuations. Also, Panama’s growth, boosted by generous business tax concessions, is projected, by the IMF, to outpace the world until 2017. Recently, the Venezuelan President announced that his country was severing diplomatic and commercial ties with Panama. Venezuela accounts for 10% of Copa’s 2014 revenue. Copa also has $487 million trapped in Venezuela and is non-transferable under the current political turmoil. About 19% of its 2013 operating income. However, Copa management has announced that flights to Venezuela are still operational. Copa’s shares were down about 8% on this news to about $126. As I said in my last article, the concept of buying say ten shares is hard when used to buy a hundred or more UK shares. An excellent time to buy if you are a value investor. I’m personally going to wait for the share to turn upwards again. Albeit this could happen quickly. I’ll keep you posted.